Are You Trading MACD Divergence Correctly? One of the most powerful technical indicators that you can use in any market is the MACD oscillator, invented by Gerald Appel in 1979. The MACD, which is short for moving average convergence divergence, is one of the most popular lagging indicators among traders as well. Many traders use this indicator to trade divergence between the indicator and price, which can be a powerful trading technique if done correctly. 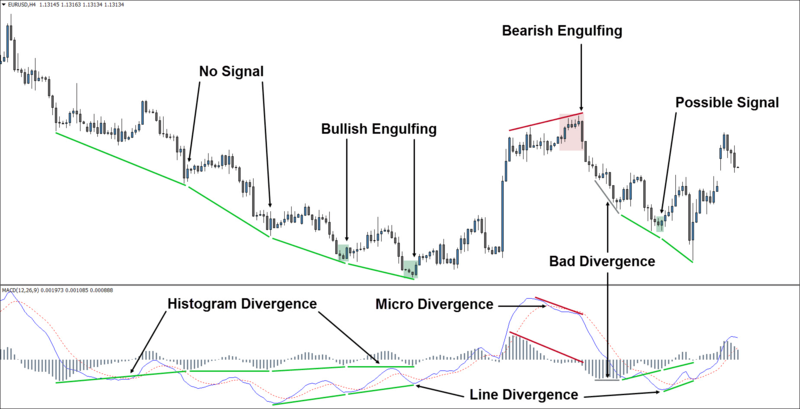 Are you trading MACD divergence correctly? In this article, I’m going to show you how to trade MACD divergence like the pros. For starters, you should determine whether or not you are using the best MACD indicator for the job. For instance, the default MACD indicator in MetaTrader 4 does not use the original MACD formula and is completely useless when it comes to trading traditional histogram divergence. I’ve also seen MACD indicators, in other trading platforms, that only display the histogram, leaving out the MACD and signal lines. In order to trade MACD divergence the way I’m going to teach you, you need to use a true, traditional MACD oscillator. The image above is an example of a traditional MACD oscillator. You can see the histogram (bar graph) in gray, the MACD line in blue, and the signal line in red. Of course, the colors can vary between platforms and indicators, or due to user settings. The MACD line is the fast line. The signal line is the slow line (average of the MACD line). The histogram shows divergence between the MACD line and signal line. Click here to learn how these are calculated. The typical definition of MACD divergence is when price and the MACD indicator are going in separate directions. As a trading method, at least in our case, we’re not talking about the divergence between the MACD line and the signal line. MACD divergence is, for example, when price is making lower lows while the histogram or MACD line is making higher lows or double bottoms. The idea is that the slowing momentum displayed by the indicator could be an early sign of a reversal. In the example I mentioned, we would have bullish divergence. We would have bearish divergence if price were making higher highs while the histogram or MACD line was making lower highs or double tops. Similarly, price could make a double top while the histogram or MACD line made lower highs. In the image above, I marked the bullish divergence in green and the bearish divergence in red. Notice that I marked divergence when price was either down trending or up trending. I completely ignored the range bound period. There are a couple of shortcomings to trading MACD divergence, and trading from a ranging market is one of them. During a ranging market, the MACD and signal line will cross the zero line frequently. You should avoid trading divergence, and possibly trading altogether, during these periods. Note: It’s also important to trade MACD divergence from distinguishable higher highs or lower lows in price. For instance, the bearish divergence (red) in the image above barely qualifies, because there were such small retracements in price during that uptrend. When traders first realize how powerful trading MACD divergence can be, they often make the mistake of trying to trade the MACD on its own. I don’t recommend this because the MACD can give many false positives on its own. Instead, I recommend using MACD divergence strategies with other trading strategies – preferably ones that use leading indicators, like price action or support and resistance. The right combination of lagging and leading indicators can provide you with a real edge in the market. In the image below, I marked the bullish divergence (green), the bearish divergence (red), and an example of bad divergence (gray). I also marked some entry signals. For the purpose of this article, we will be using price action signals in conjunction with the different forms of MACD divergence. Starting from the left, you can see some traditional MACD histogram divergence. The histogram is making higher lows or double bottoms, while price is making lower lows. If we were using price action as our confirming entry signal, we would have skipped the first two examples of bullish divergence, because there were no bullish candlestick signals to confirm our entry. 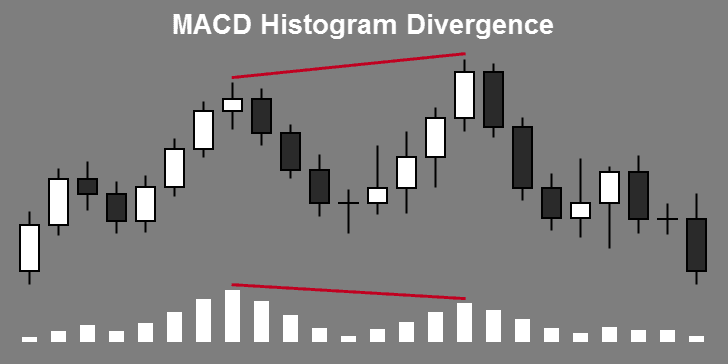 The next two examples show both histogram and MACD line divergence. They also both developed bullish engulfing signals which could be used to confirm entry at each of those divergence points (click the image for a better view). Note: Oddly enough, according to the way I trade candlestick patterns, I would have made a full take profit (2:1) after the first bullish engulfing pattern. I would have been stopped out at break even, if I had taken the second bullish engulfing pattern. At first glance, you would think it should be the other way around. Next, we have an example of bearish divergence. A strong candlestick signal, the bearish engulfing pattern, developed at this point as well, confirming its significance. During this period, the divergence occurred between price and the histogram. Divergence also occurred between price and the MACD line. You’ll notice that the MACD line only made a small kink (or micro divergence). Micro divergence can occur when price is making smaller retracements, or during periods of high volatility. Either way, micro divergence can be a very significant signal in the right situation. After that, I marked a bad example of divergence. The reason this doesn’t qualify as a good example of divergence is because the retracement that made the first low was so small that it’s barely noticeable. Remember what I said about distinguishable higher highs or lower lows in price being important? Price action through this area is too smooth. There was not enough up and down movement in price to establish any distinguishable lows. Compare this period to the downtrend on the left of the image. There you can see very distinguishable lower lows in price. The lows on the histogram were also very distinguishable, which is helpful but not critical. Next, we have another example of bullish histogram divergence. This bullish divergence also coincided with a possible bullish candlestick signal, a bullish engulfing pattern. However, the real bodies of the candlesticks are relatively small compared to the other candles in the area. For that reason, I would have skipped this trade, although it would have worked out. Finally, we have another example of bullish divergence that occurred between price and both the histogram and MACD line. In this case, there was no candlestick signal to confirm a trade, so we would have stayed out of the market. Hopefully, you can see from the examples that I’ve given that learning how to trade divergence between the MACD and price can be a very powerful tool in your arsenal. Trading MACD divergence in combination with almost any other type of trading strategy can increase that strategy’s profitability exponentially. Trading MACD divergence, if done correctly, can provide you with a real edge in the market. It can be a powerful early indicator of trend reversals when combined with another trading system – preferably a system based on leading indicators. MACD divergence isn’t foolproof. This technique does not work well in range bound markets, and on its own MACD divergence will often give you many false positives. This is especially true when the market is trending strongly in one direction for an extended period of time. It is important to only trade divergence signals that occur during periods of distinguishable higher highs or lower lows in price. Strong, parabolic moves in price, in one direction or another, with little to no retracement, do not make good divergence signals. Are you trading MACD divergence correctly? Hopefully, this article shed some light on any mistakes you might be making with this popular trading technique. Like anything else in trading, you can’t expect to be an expert divergence trader overnight. Be sure to do plenty of backtesting and demo trading before trying any new trading strategy in your live account. Thanks for the comment. Yes you are correct. That would be an example of regular divergence. In your example, the stronger divergence pattern would be when the histogram or MACD line are making lower highs. Divergence formed by double tops or double bottoms in either the MACD indicator or price are in a slightly lower class of strength. Thanks so much for the reply! Learnt much from your site! No problem. Thanks for the kind words, and thanks for reading! 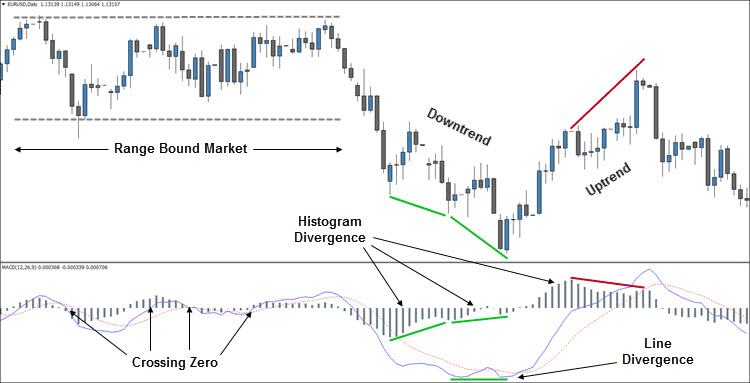 Do you know of a good indicator that automatically draws MACD divergence on MT4. I’ve looked everywhere they are all flawed. most miss many signals. Thanks for the comment! I agree… they’re all flawed. The MACD indicator that I got with the Forex Gemini Code actually did a decent job of automatically drawing regular and hidden divergence. If anything it draws too much divergence, including cases that I would not consider trading. I still prefer to just use the free MACD true indicator, because I’m only interested in trading the really obvious instances of MACD divergence anyway. I little bit of subjectivity goes into good divergence trading. You can’t really program an indicator to do something that you can only learn through experience. Is it possible to have both hidden and regular divergence at the same time?… and if so, which do I follow? Thanks for the comment, Deon. You can’t have them at the exact same time since they’re based on opposite sides of the trend. However, you can have one followed by the other. It’s rare that momentum would come into the trend and then immediately leave and vise versa. If that happens, you should trade the signal that came last, although regular divergence tends to be stronger. The other option is to just choose another trade. That’s what I would do. I hope that helps. I used to trade divergence many years ago. I remember I had a lot of them that worked, and a lot that didn’t work out. It’s really boring waiting for divergence form because you literally watch an entire move happen, and then you are waiting for a top or bottom to form. Now, I try to get a part of that move that happens before divergences start setting up. Back when I was looking for divergences, I used to trade intraday. Now I’m comfortable with daily charts. Intraday is just too crazy for me. I don’t get too bored because, when I check the charts, divergence is either setting up or not. If there’s no set up at the time, I walk away for a bit and do chores or run errands. Trend trading is supposedly the easiest way to make money trading. When I trade stock options, that’s all I do. However, in the Forex market, I’ve had more success with reversals. You can use hidden divergence to trend trade, BTW. The Top Dog Trading system even uses mini regular divergences on the stochastic oscillator to jump into trends during pullbacks. I agree that the daily charts are better for most traders, especially if you’re starting out. There are a lot of advantages and the only disadvantage is that you have to be a little more patient. How much percent can I win if I only trade with macd divergence !? I don’t recommend trading MACD divergence or any other type of divergence alone. Try combining MACD divergence with candlestick patterns. That’s worked well for me in the past. As far as how much you can make. I can’t tell any trader that. There are too many variables, including but not limited to how well you control your emotions while trading, how consistent you are, how thorough you are at journalling and what you learn in doing so, and much more. I can only tell you that using MACD divergence and hidden divergence in combination with candlestick patterns worked well for me in the past. That’s what I was doing before I found DTFL. If I wasn’t using DTFL, that’s the method I would still be using. What are the parameters for setting a MACD or do I use the default setting on my MT4? In my experience, these signals work best when using the standard MACD settings of 12, 26, and 9. The default MT4 MACD indicator is not standard, though. You cannot use the standard settings in the default MT4 MACD indicator. They will not display correctly. You’ll need to download the free MACD True indicator from this site or get something similar. Compare the two and you’ll see what I’m talking about. Do that or use a different trading platform than MT4. Most other trading platforms use the standard MACD settings by default.